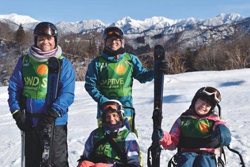 This program is designed for young persons with disabilities living in Asia and the Pacific who have the willingness and the potential to become leaders in their communities and to work for persons with disabilities. 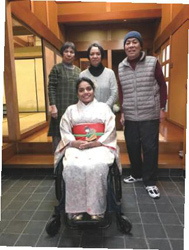 The program offers such young individuals with disabilities an opportunity to learn about welfare policies and services for persons with disabilities in Japan and thereby to obtain knowledge and skills that will support their future activities. 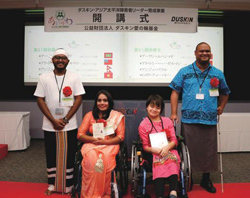 It was first initiated in 1999 by the Duskin AINOWA Foundation as a project commemorating the Asian and Pacific Decade of Disabled Persons (1993-2002). 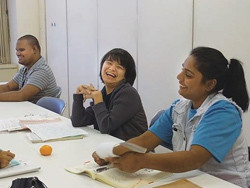 Over the past nineteen years, the program has invited 133 people from all over Asia and the Pacific to Japan. A maximum of 10 places are available. In principle, only one trainee can be selected from each country/region. 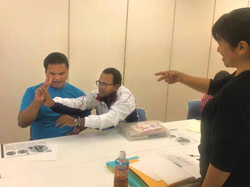 Training takes place at a variety of locations across Japan, including rehabilitation centers for persons with disabilities, educational institutions and organizations of/for persons with disabilities. (1) Fill in the application form in either Japanese or English. Type or handwrite clearly. The application form consists of 8 pages and has 28 sections. Do not exceed the space provided for each section. (2) In Section 10, tick an appropriate box. If you tick‘ I work’ or‘ Other,’ clarify the type of your organization/work and the form of your employment by ticking all appropriate boxes or giving details. (3) In Section 11, refer to any organization of/for persons with disabilities that you are currently involved with as a member, user and volunteer etc. Do not include any information that you have already mentioned in Section 10. (4) In Section 12, write down the name of school/university/any other educational institution from which you graduated and state your major. Do not include any information you have already stated in Sections 10. (5) In Section 13, write down the names of your past employers and the duration of each employment, if any. Then briefly describe each organization and your role. Do not include information you have already stated in Section 10. (6) In Section 17, describe your current situation regarding your disability in detail, including medical data. Also clarify if you need any assistance in daily life (and if so, of what kind). It is very important for us to correctly understand your disability and current situation. (7) In Section 24, give the name and contact details of a person who can act as your referee, such as your teacher, current/past employer, etc. Your referee must be able to discuss your skills and personal qualities. He/she must not be related to you by birth or marriage, be in a personal relationship with you, or live at the same address as you. (8) In Section 25, give the name and contact details of a person who can act as your surety. Your surety will be liable to the Sponsor and the Operating Organization for your fulfillment of your obligations as a trainee, including an immediate payment of any financial debt. (9) In principle, you are expected to fill in the application form by yourself. However, if you have difficulty in doing so, another person may do it on your behalf. In this case, you must clarify this in Section 26. (10) If you are applying by post, attach a photo showing your face and whole body to the first page of the application form. Write your name on the back of the photo. If you are applying by email, send your photo as a separately attached file preferably in the JPEG format. The size of the photo must not exceed 2MB. (13) You must send your application only once by one of the methods shown above. We regret that we cannot accept applications sent by FAX. (14) Your application and attached documents will not be returned. (15) The Secretariat will not acknowledge receipt of applications respectively. Applications sent by email after this date will not be considered. If you are posting your application form, it needs to be postmarked on or before August 8, 2018. (1) The Executive Committee, consisting of 9 members and 1 advisor, will screen all valid applications and shortlist applicants. (2) The Secretariat will contact each shortlisted applicant in order to arrange an interview in his/her own country/region. Then a member(s) of the Executive Committee will travel and meet him/her in order to assess his/her suitability as a trainee. (3) The Executive Committee will make final decisions at a committee meeting. (4) The Secretariat will inform all applicants of a result by post by the end of May 2019. (5) No application-related questions can be answered during the selection process. (i) Cost of traveling between the trainee's home town and Japan, including international flights and domestic transportation. (ii) Fees for necessary travel documents, such as passport and visa. (iii) Cost of training during the program. (iv) Living expenses such as accommodation and food, supplemented by daily allowances. (2) The trainee will bear any other expenses which are not listed above. If you have any inquiries, please contact the Secretariat by post, telephone or email (Inquiries by telephone will be accepted from Monday to Friday from 10:00-12:00 and 13:00-17:00 Japan time). Copyright © Duskin Leadership Training in Japan, All Rights Reserved.